A simple and delicious curry with chickpeas, spinach, pumpkin and coconut milk. 1. Grind the onions, ginger, garlic and red chillies until smooth. 2. Heat 1/2 tsp oil in a pan over medium flame. 3. Add the ground onion paste, cumin powder, garam masala powder, turmeric powder, coriander powder and stirfry for a minute. 4. Add the pumpkin pieces and spinach. Cook for 3 to 5 minutes. 5. Add the chickpeas, coconut milk and 1/2 – 3/4 cup of water. 6. Cover with a lid and simmer for 10 to 15 minutes. 7. Remove from flame and add lemon juice. 9. Serve with cooked rice. 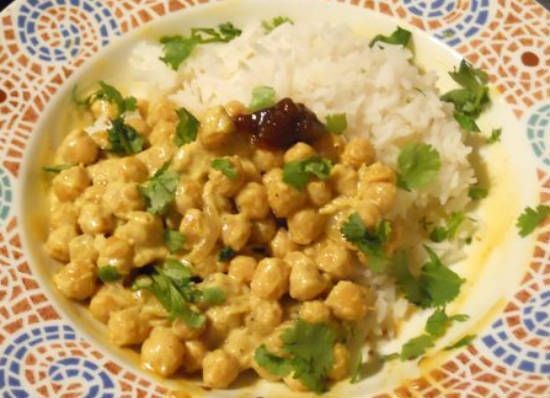 Feel free to comment or share your thoughts on this Coconut Chickpeas Curry Recipe from Awesome Cuisine.